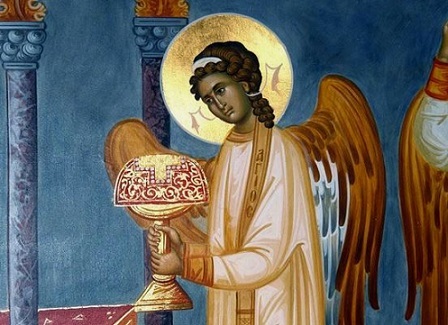 In a previous post, the role of the angelic realm in liturgical worship was briefly discussed. The primary place in which the lives of Orthodox Christians intersect dynamically the angelic realm of God’s heavenly council is within worship broadly and the Divine Liturgy in particular. The reality of angelic presence and participation in the worship of the Holy Trinity is referenced continually in liturgical hymns and prayers as a means to awareness of this reality. God’s divine council, including the angels and the saints in glory, participates in Christ’s reign over creation in both governance and in the public work (Gr. leitourgeia) of worship. This takes places continuously in the unseen, heavenly realm and is joined by human persons in worship and in prayer. This realm also includes the demonic powers who previously held the nations of the Gentiles enslaved through their worship, which brought about all forms of corruption, the pinnacle of which was sexual immorality. This understanding of the spiritual world stands in the background of many of St. Paul’s discussions and practical instructions to the churches which he had helped to gather and organize. It stands in the background of Romans 1 and Galatians 2. Importantly, this understanding is necessary to make sense of the overarching discussion in 1 Corinthians 10 and 11. In this section of his overarching argument in the First Epistle to the Corinthians, the Apostle speaks concerning food offered to idols, the Eucharist, idolatry, and the necessity of women covering their head for prayer and issues related to hair. Taken in and of itself, and out of its context within the Jewish religion of the 1st century as described above, this section may seem to be a random jumble of various instructions and ideas loosely connected by the idea of worship. When the background of St. Paul’s thought is understood, however, the uniting thread of the argument becomes apparent. St. Paul begins 1 Corinthians 10 by speaking concerning idolatry, specifically the idolatry committed by the nation of Israel after its deliverance from Egypt. St. Paul makes the point that these horrible examples of idolatry and the consequences for them that ensued, took place after the salvation of the Israelite people. He uses sacramental terms of baptism, the eating of spiritual food and the drinking of spiritual drink to set the stage for the status of these people before they engage in idolatrous behavior. This is important for St. Paul’s Gentile, formerly pagan audience. In the past, before they had heard the gospel, God had been merciful in overlooking sins, but now that they have received Christ, they are accountable (Acts 17:30-31; Rom 1:18). They are now constituted as God’s own people and they will be held accountable for their sins at the judgment as well as invoking consequences for those sins in this present life. St. Paul brings up two particular instances of idolatry which are important to understanding his purpose in this section of the letter. In both of these cases, the worship of beings which are not gods was joined together with sexual immorality. The early Jewish understanding of idolatry included both of these elements because pagan religion freely mingled immoral sexuality with ritual practice in service of their gods. St. Paul first brings up the incident with the golden calf. Because all sacrifices are meals, after offering sacrifices to the calf, the Israelites feasted. St. Paul quotes Exodus 32:6, “The people sat down to eat and drink and they rose up to play.” The Hebrew word here translated as ‘play’ is often used for sexual overtures (cf. Gen 26:8; 39:14, 17). His second reference is to the incident at Baal Peor described in Numbers 25:1-15. The men of Israel engaged in the worship of Baal with Moabite women which also involved engaging with them sexually. As a result of this apostasy, a plague fell upon the Israelite camp and as St. Paul reminds us, 23,000 died in one day. This occurred because this idolatrous immorality was brought into the place where God himself dwelt among his people. 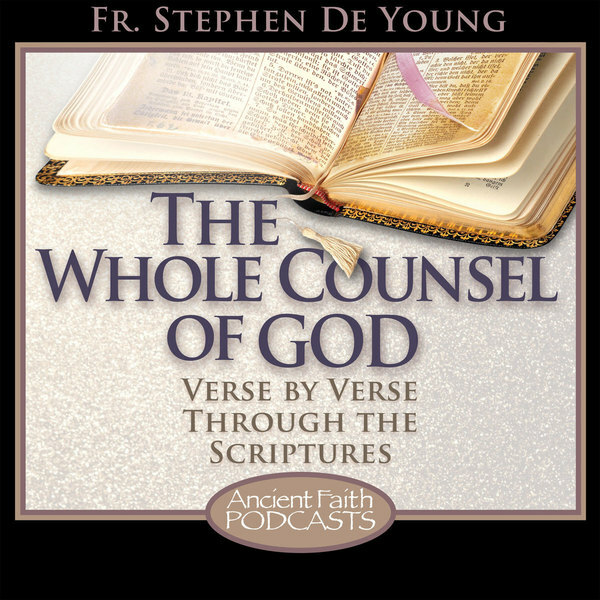 The Apostle then speaks about the Eucharist as a sacrifice. In the pagan Roman world, the ‘public works’ of the sacrifices were what bound together families, communities, cities, and the Empire itself and what bound those social units together with the spiritual powers who were thought to be their patrons. St. Paul points out that the sacrifices of the temple in Jerusalem served that same purpose in creating and binding together the Jewish nation and connecting her to her God (1 Cor 10:18). The Eucharist, then, does the same thing in uniting the participants to Christ and to one another as one body, Christ’s (v. 16-17). What the pagans sacrifice, however, they sacrifice to demons. To unite one’s self to demons after one has united themselves to Christ sacramentally is to provoke the Lord (v. 22) in the same way in which Israel provoked the Lord in the wilderness in the preceding examples. St. Paul will return to explicitly discussing the Eucharist at the end of chapter 11, but before this, he discusses the issue of women covering their head in the Eucharistic gathering and of hair. This is not a random interjection, but a continuation of St. Paul’s thought. In the background of this discussion is the understanding, found in Greek and Roman medical texts, that hair, particularly in its length and volume, is an indicator of sexual receptiveness and fertility. For 1st century medical science, it was not merely that wearing hair in a certain way sent a certain signal, but they believed there to be a direct connection between quantity of hair and fertility. It is for this reason that St. Paul says that a man wearing his hair long is a shame to him in that it is directly related to homosexual behavior (11:14). For a woman to display her hair, then, was for her to make a display of her receptiveness to sexual contact and her fertility. It is this sexuality which St. Paul finds inappropriate for church. It is inappropriate for a wife to make such a display toward other men (v. 6). If a married woman were to cut her hair short or shave her head, this would by the medical standards of the time amount to a form of birth control, and indicator that she did not wish to bear children with her husband. Therefore, St. Paul argues for a head covering (v. 6). The intent here was not to create a law regarding a head covering as such, but to speak to the promotion and invitation to sexuality within the Eucharistic gathering. The Israelites sat down to eat and drink and then rose up to play. The Eucharist is not a feast like those of the pagan gods which served as a precursor to the erosion of social boundaries and indulgence, least of all sexual. St. Paul includes in his particular discussion of women covering their heads a reference to the covering taking place ‘because of the angels.’ This is a reference to the state of affairs in Genesis 6:1-2, in which it was understood that demonic fornication produced giants. St. Paul is not, per se, making an argument that this is something which is going to occur again in the same way. He is, however, giving yet another example of the link between the worship of demons and fornication. This understanding of ritual sexuality is the antithesis of Eucharistic worship. And so, after speaking of this sexual element, it makes perfect sense that St. Paul continues his contrast between the Eucharist and the pagan feasts by discussing the fact that the Eucharistic celebration is likewise incompatible with gluttony and drunkenness (v. 21). Both of these other sins are further examples of a lack of self control concerning the flesh. St. Paul then brings the entire discussion of these two chapters back to where he began. When the Church gathers to celebrate the Eucharist, Christ is in their midst. There is, therefore, a danger if the people bring with them unrepentant immorality or divided spiritual loyalties into Christ’s presence. Just as this resulted in plague and in the affliction of serpents in the case of the Israelites (10:9), so also now many in Corinth have fallen ill and some have even died (11:30). As in the case of the Israelites, this immorality and lack of repentance has consequences not only for the immoral and unrepentant individual, but for the entire community. For this reason St. Paul is teaching Eucharistic discipline, including excommunication both to preserve the community and for the sake of the salvation of the person who must be brought to repentance (1 Cor 5:1-12). For St. Paul, sexual immorality represents the pinnacle of sin as the degradation of humanity which leads to destruction (Rom 1:24-27; 1 Cor 6:12-20). As he observed the pagan Roman world, therefore, it was not at all surprising to him that idolatry went hand in hand with sexual immorality. Indeed, the pagan rites were themselves manifestations of sexual immorality as well as the worship of demons. It is therefore, for the Apostle, impossible to separate right belief and right worship from chastity as the pinnacle of moral purity. This is true not only for St. Paul as if it were peculiar, but for all of the New Testament authors (cf. Rev 14:1-5). For the entire Christian Church, the abandonment of pagan idolatry and sexual immorality represented the one absolutely necessary condition for Gentile converts to the Christian faith (Acts 15:19-20, 28-29, discussed further here). This call to sexual purity and holiness became a marker of the early Church over against a sexually degraded Roman society. The pagan Roman physician Galen, observing the behavior of early Christians from without, said that average Christians, in their sexual morality, were ‘advanced in self-discipline and…moral excellence…in no way inferior to true philosophers.” By speaking to women regarding the covering of the head, St. Paul did not demean them, but called women to a role of leadership in the preservation of chastity. Christian women, as exemplified by great saints such as St. Thekla, assumed this role, such that another pagan, Libanius, said regarding them, “What women these Christians have.” Chastity before, within, and outside of marriage is as critical an element of Christian Orthodoxy as the dogmas of the faith or the celebration of the liturgy. From St. Paul’s perspective, in fact, it is worse to hold to the dogmas of the faith and receive the sacraments while leading an immoral life than to live one’s life in ignorance of the truth apart from Jesus Christ. Thank you for another very helpful teaching. There is, however, a particular verse in Corinthians that still remains unclear. I think it is because I am trying to correct what I have been taught in the past and the correction is hard to put into words. In the non-denominational church I was in, St. Paul’s teaching on women’s head coverings was addressed. They said this was customary only in St. Paul’s day and we no longer have to abide by such a custom. They took 1 Corinthians 11:16 as proof: “But if a woman has long hair, it is a glory to her; for her hair is given to her for a covering. (16) But if anyone seems to be contentious, we have no such custom, nor do the churches of God” . In other words, they said it is no longer customary; the hair on her head is already a covering; if one was to insist on head coverings they would be labeled ‘contentious’. If you would, please explain what St. Paul is referring to when he uses the words ‘contentious’ and ‘no such custom’. Father Stephen! I am sorry….I did not see your response until after I posted! I thought the delay was because I asked amiss! So, thank you…you are right, the original teaching I received does not make sense in light of what St. Paul said in the previous verses. I see now what he meant by ‘contentious’. I didn’t go into much detail on it in the piece because the discussion gets pretty sexually graphic. But with that caveat, this material begins with the Hippocratic Corpus and you can start with “On Diseases of Women” in terms of primary sources. In terms of studies of the issue, there’s a pretty good survey of the Jewish, Christian, and later Muslim traditions related to his in an article by Tahmina Tariq called, “Let Modesty Be Her Raiment: The Classical Context of Ancient-Christian Veiling”. In terms of just surveying the medical material, Troy Martin’s article from several years ago is probably the best overview. I immediately thought of this post and comments, and the article by Troy Martin as well. Thank you Father. How enlightening!